There are many health benefits of eating figs and if you’re not eating this nutritious food, then it’s time to start! Figs are a great source of potassium and fiber. They’re great for keeping blood pressure levels within a normal range. The fiber in potassium helps to lower cholesterol levels. Figs are good for staving off cancer and for preventing the onset of diabetes. Figs are also a good source of calcium. Figs are a good food to eat if you want to improve the quality of your sleep. Figs have been shown to aid in good sleeping habits for those struggling with insomnia, a great health benefit of figs. Figs are a good source of energy. Figs could help in the treatment of constipation. Figs are a good source of calcium and could promote strong and healthy bones—definitely an important health benefit. Figs are soothing for those with stomach acid problems. These are some of the great health benefits of figs. But what about fig leaves—did you know that there are also significant fig leaves health benefits? Perhaps the most well-known of all the fig leaves health benefits is the ability of the plant to exert strong anti-diabetic effects. Fig leaves have the power to reduce the amount of insulin a diabetic needs to take. In one clinical trial, researchers studied the hypoglycemic effects of a fig leaf extract. Six men and four women were recruited for the trial. All had to be dealing with diabetes for about seven years. The participants continued to manage their diabetes through diet and a twice-daily insulin injection. They were also given a fig leaf extract or a sweetened tea. The researchers then compared notes between the two groups. They took measurements of post-prandial glycemia and cholesterol, along with some other markers that showed diabetes status. They found that post-prandial glycemia was significantly lower in the fig leaf extract group. What’s more, the average insulin dose for those taking the fig leaf extract was 12% lower compared to the control group. Other fig leaves health benefits include lowering triglycerides. Triglycerides are a form of fat that circulate in your bloodstream. These fats can be one of the factors that contribute to heart disease. On the cancer front, fig leaves may be able to stop the growth of certain types of abnormal cells, preventing the onset of invasive cancer, an important health benefit of fig leaves. Here are some home remedies that use fig leaves. For bronchitis, put three fig leaves in a pot of water and boil. After 15 minutes, remove the leaves and drink the tea. Add honey for a sweet taste and added infection-fighting power. 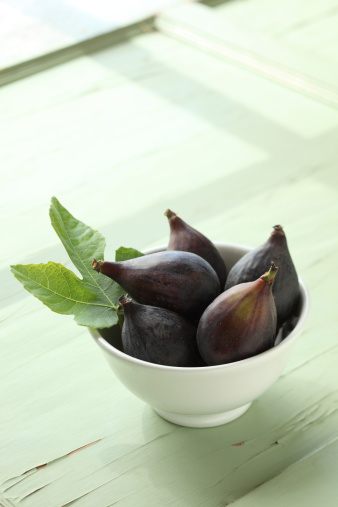 For those with heart problems, eat some fresh figs every day and make a tea from fig leaves. Make a boiled fig leaf tea. Let the mixture cool and then apply to affected areas to treat a hemorrhoid. Drink a fig leaf tea to help lower blood pressure. One folk remedy suggests chewing two fig leaves and swallowing them to help treat an ulcer. Trejo, B., “Fig Leaves Provide a Natural Health Remedy for Diabetes.” Natural News web site, Sept. 18, 2009; http://www.naturalnews.com/027050_figs_health_natural.html, last accessed Nov. 6, 2013. Serraclara, A., et al., “Hypoglycemic action of an oral fig-leaf decoction in type-I diabetic patients.” Diabetes Res Clin Pract. January 1998; 39(1): 19-22.